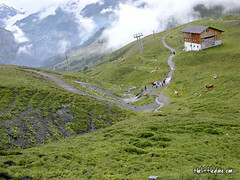 Interlaken means “in between lakes”; the town is located between Lake Brienz and Lake Thun. Interlaken is famous amongst tourists from all around. 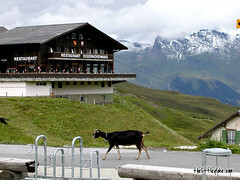 The town itself has simple appearance but to be compromised by the snow-capped mountains around it. with shops and restaurants promoting in Korean and Japanese languages". After settling down at a backpackers' hotel, we strolled around the town in search for cultural inspirations(nah, to my wife that's souvenir shopping). It's a cosy little town with lots of varieties of food, shops and tourists. 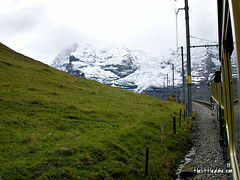 The next morning, we were at Interlaken Ost station again to catch the train on a return trip to Jungfraujoch (Interlaken Ost - Lauterbrunnen - Kleine Scheidegg - Jungfraujoch - Grindelwald - Interlaken Ost). We bought the Good-Morning-Ticket cost around 20% cheaper than the normal price and valid for the train departed at 6:30am and return before noon. 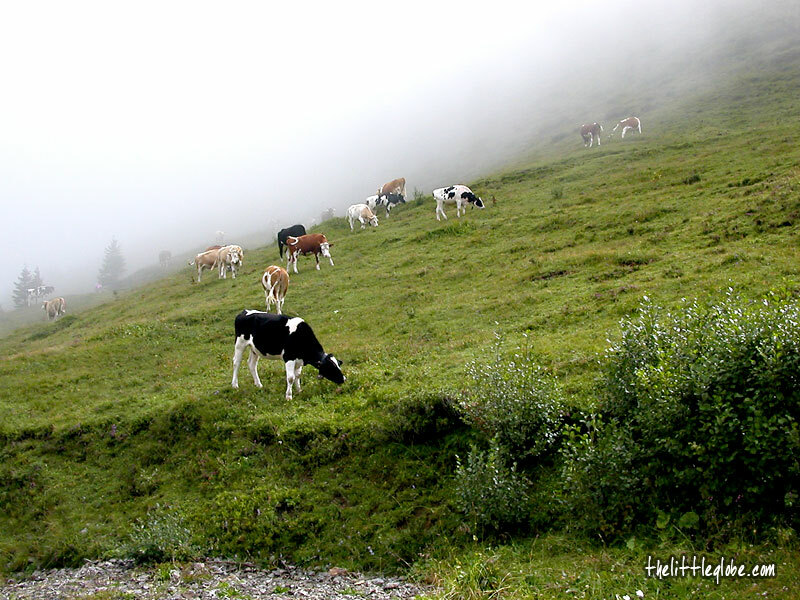 The Swiss High-Alpine Scenery was simply astonishing! 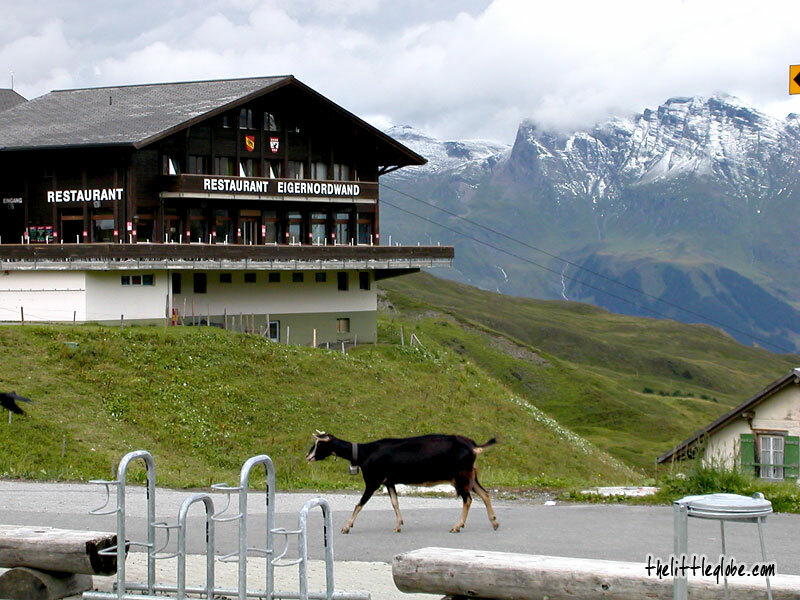 First, the cogwheel railway took us to Kleine Scheidegg, there we boarded another train from Jungfrau Railway bound for Jungfraujoch. 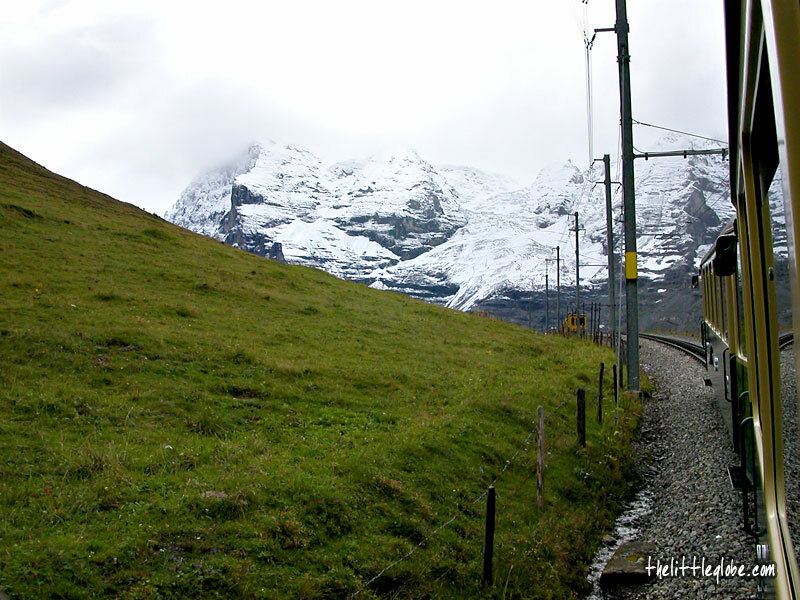 Interestingly, the train made a stop in the middle of the Eiger tunnel for five minutes allowing the passengers to enjoy the spectacular view (bad weather on that day, we saw nothing) through observation windows hewn from solid Alpine rock. That also allowed the passengers to take it easy to avoid dizziness caused by drastic change of pressure due to the altitude. 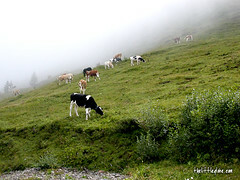 On Jungfraujoch, the weather wasn't good; it was misty, snowing and windy. 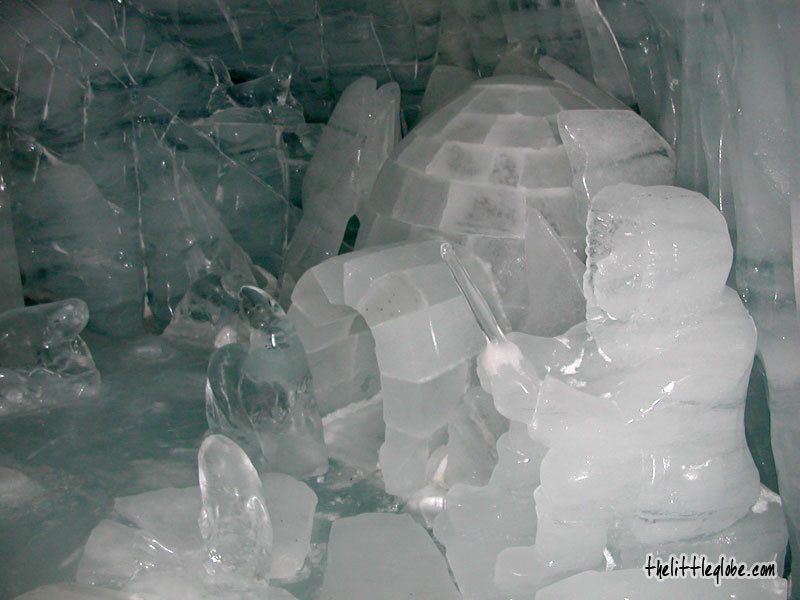 The Ice Gateway and Glacier Plateau were closed. 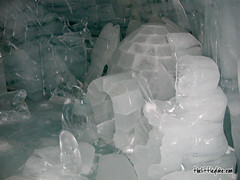 So, we only manage to visit the Ice Palace, Sphinx Terrace (an observation post) and High Alpine Research Exhibition. We enjoyed much of the trip except for the bad weather. This remarkable trip crafted good travelling experience with the high altitude train ride, Alpine scenery (cattle, green hills, wooden Alpine houses, snow capped peaks, etc.) 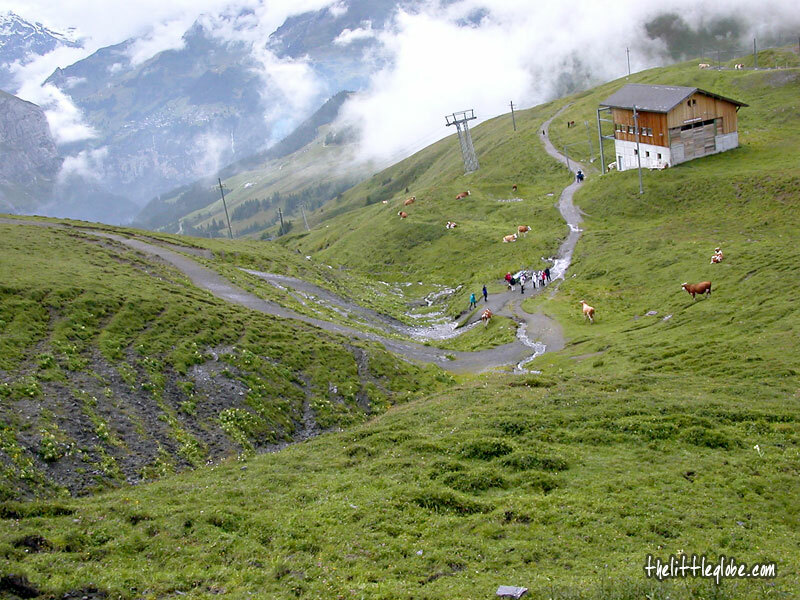 and harsh mountain weather on Jungfraujoch(on a bad day). Absolutely beautiful place; was there. Unforgetable. In May 2006 I'm putting my house on the market and when it sells I'm buying a van and heading off in the general direction of Spain with my partner and 4 year old daughter. Where we'll end up, and what we'll do I haven't a clue. If you'd like to exchange links, please email me the URL and title of your blog and I'll add you to my travel-blog links. Wishing you a wonderful Christmas and an adventurous New Year. As an ongoing process to increase the link popularity of our travel site , we are looking for some good quality sites to exchange three way links with our website. I recently came across your site through Google Search and found it beneficial and informative for our site's visitors. For our mutual benefit, I would like to Exchange Link(s) with your website, in return I will post your link at same value page without any delay. If you find the whole concept interesting, then i request you to send your site details to be added ASAP. If you'd like to discuss this further, please feel free to contact us at anthony@global-car-rentals.net.